In Granada, one of the most impressive building projects of the Middle Ages has begun: the construction of Alhambra. A palace, fortress, and a small city -- all-in-one -- Alhambra is made up of the world’s most beautiful gardens, pavilions, chambers and towers. The most prominent builders in all of Europe and Arabia want to demonstrate their skills in building Alhambra. Employ the most talented teams of builders to construct your Alhambra. Hire stonemasons from the north and gardeners from the south, who all want a fair wage and insist on being paid with their native currency. With their help, towers can be constructed, gardens designed, pavilions and mezzanines erected, and manors and royal chambers built. 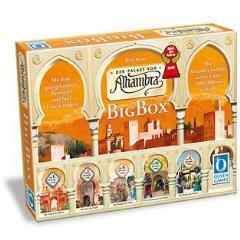 Compete against your opponents to build the greatest and most impressive Alhambra. This BIG BOX contains the basic game and all 5 expansions. The box liner is designed to hold all the expansions separately for easy access and after-game storage.